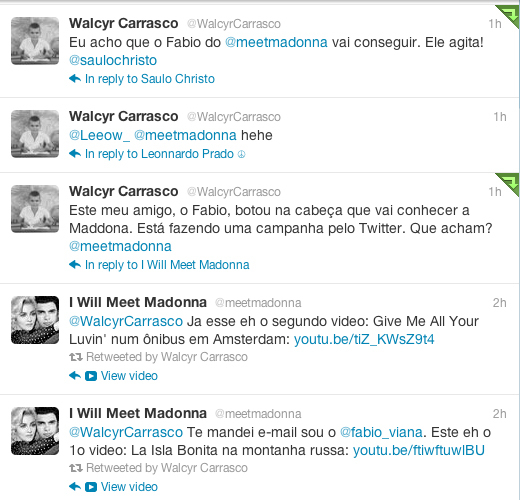 Walcyr is a well-known writer in Brazil and all his “telenovelas” or soap operas are always a huge success! Xica da Silva, Chocolate com Pimenta (Chocolate with Pepper), Alma Gêmea (Soul Mate) and O Cravo e a Rosa (The gillyflower and the rose) are some of his most famous telenovelas. Currently, Walcyr has a really big challenge: he is adapting the book Gabriela from another famous Brazilian writer, Jorge Amado, to make it in a new telenovela. This entry was posted in Press, Support and tagged Eliomar, Madonna, Soap Opera, Support, Telenovelas, twitter, Walcyr Carrasco. Bookmark the permalink.